Memory Lane Friday is a time each week to write about your childhood, preserving those memories for your family. Each week is a different theme (but of course you can always write about whatever you'd like). This week's theme is a favorite book. I was a big reader growing up. Still am. BIG READER! I hope that the boys learn to love to read as much as me. One of the biggest challenges of loving to read is picking a favorite book. So many to choose from. 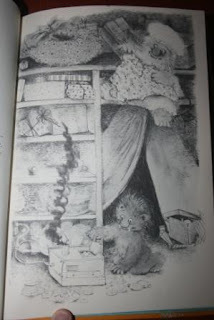 Some of my favorites growing up were The Root Cellar, Summer Pony, Key to the Treasure, The Bear's Toothache, The Pink Motel, and Z for Zachariah. But I decided to go with the book I loved so much that I stole it. Or at least hid it. You see, it was a library book. And I just couldn't quite bare to return it. So it "disappeared" when I was about 5 years old. Good Night Orange Monster is about a little boy named Ken who is afraid that a monster lives in his closet. 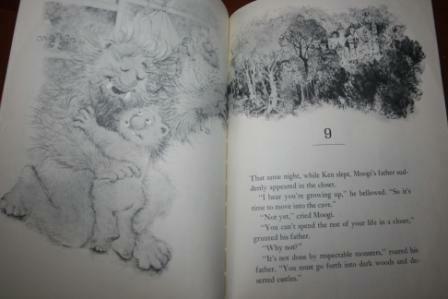 Indeed, there IS a monster in Ken's closet and his name is Moogi. Every night Ken refuses to go to bed. He begs his mom for another drink of water. Around Christmas, Ken's mom hides his presents in the closet, since she knows he is too afraid to go in there. Moogi finds the presents, which include a monster making machine. While Moogi's mom knits him a spider web quilt, Moogi spends the nights making monsters even though the machine fills the closet with smoke. This all works out just fine until Christmas. Ken just loves his new monster making machine, and tries so hard to make a monster that looks like Moogi. Meanwhile, Moogi is totally bummed that his machine is gone. So when Ken is sleeping, Moogi sneaks out to use the machine in the middle of the night. As you might guess, Ken and Moogi end up being friends and making monsters together. Until Moogi's father decides he is too old and comes to take him off to live in caves and castles. Just grab the code below the button and paste it into your blog. Then come back and add your website into Mister Linky. If you have time, don't forget to check out others' blogs! That looks like a cute book. Is that the actual library book that you permanently "borrowed"? I wonder what kind of fines you've racked up since then! I absolutely LOVED "Summer Pony." I had the one illustrated by Sam Savitt forever. But somehow it has gotten lost in the number of moves I've made. Would've been fun for Livie to have the same "Summer Pony" book. Ah, well. Love Orange Monster, but think every post should have at least one picture of a kid in it. Try to do better next time. I do, however, have my original copy of Summer Pony and a few others. That looks like a really cute book. Sad that Moogi had to go away eventaully though. I guess it's kind of like Puff the Magic Dragon, where adults can't go to Honalee. Love that you "forgot" to return the book. 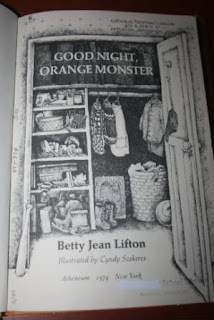 I'm not familiar with The Orange Monster, but I do have wonderful memories of my mom reading the original series of the Wizard of Oz to me, and they were the same set of books that her mother had read to her. I have the set now, and even though my kids have never been interested in these old books, just looking at them on the shelf brings a smile to my face. Thanks for sharing your wonderful memories.